В 1927 году "Short Brothers" построила самолет S.11 Valetta, который использовался сэром Аланом Кобхемом для исследования районов Нила и Центральной Африки в 1931 году. THERE was a time when there was considerable controversy on the subject flying-boat or twin-float seaplane. Experience has tended to what amounts almost, in this country at any rate, to standardisation, the flying boat type being used for large craft and the twin-float arrangement for medium-sized and small craft. That there is still room for discussion, even in the larger sizes of marine aircraft, of the problem boat or floats may come rather as a surprise to many, who by having become accustomed to think of all large marine aircraft as boats and all smaller marine aircraft as float types, may have assumed that this division of types was more or less final. 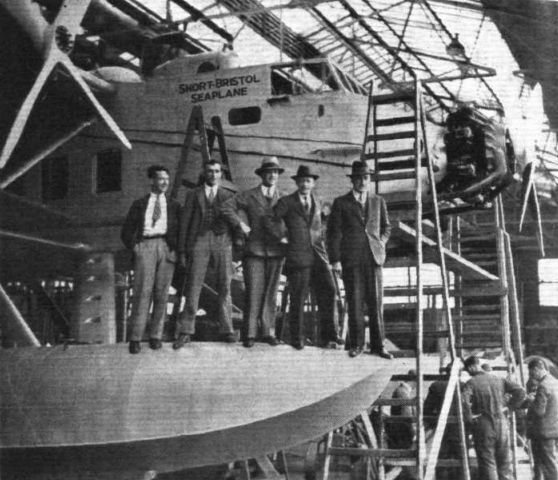 Those in close touch with British aviation have known that Mr. Oswald Short, one of the pioneers of the British aircraft industry, has long held the view that, even in quite large sizes, the twin-float arrangement might still be found to be a serious rival of the flying boat type. The opportunity has now occurred for testing out in practice this idea, and the large Short three-engined twin-float monoplane illustrated this week is the interpretation of Mr. Short and his technical staff of the large twin-float machine. Whatever the result of practical experience may later prove to be, the twin-float arrangement does have this advantage that, should it be desired to do so, the machine can readily be converted into a landplane. 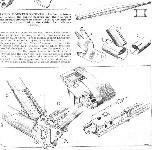 In fact, an undercarriage for this purpose was designed concurrently with the design of the machine as a seaplane, and the landplane is illustrated in one of our drawings. 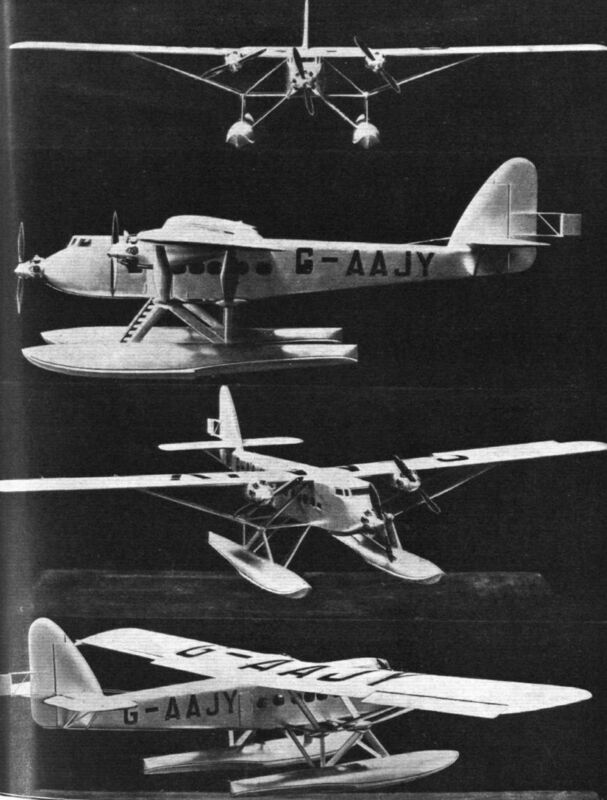 A flying boat type could be fitted with a beaching trolley, and could even be made amphibian, but its conversion into a pure landplane would be likely to be a somewhat makeshift affair. One very great advantage of the Short design is that, for a long Imperial air route for instance, on which seaplanes have to be employed over certain stages, landplanes over others, the same type of machine can be employed, the only difference being in the undercarriage used. If, as there is no reason to doubt, the machine proves equally serviceable in either form, the use of one type of machine throughout a long route will have a number of considerable advantages in that maintenance crews familiar with the seaplane type will be equally familiar with the landplane. The number of different spares to be stocked will be reduced to a minimum, and finally it is to be presumed that the price will be reduced because the operational company would be able to order straight away for example 10 machines instead of possibly five of one type and five of another. So that altogether there is much to be said for the Short design. In this connection it is worth noting particularly that the machine was designed primarily as a seaplane. Usually a machine is designed as an aeroplane and then, when wanted for marine work, "put on floats." The distinction is not, perhaps, a very obvious one, but it is one that may be of no small importance. A further important point in favour of this adaptability to float or land undercarriage is that one machine in reserve will suffice where otherwise two would be required. A complete machine, one imagines, would be kept in readiness but without its undercarriage. In case of a mishap to a machine in service, the spare, machine would be fitted with the requisite undercarriage and sent at once to the route section where it was wanted. An examination of the three-view general arrangement drawings and of the photographs of the scale model reveals a number of interesting points in the conception of the new Short machine. To begin with, it is a monoplane, a fact which is in itself unusual in this country where hitherto the biplane has been the familiar type. The choice of the monoplane wing arrangement has brought with it the placing of the wing engines close under the wing surface, in streamline nacelles. The manner in which a wide track for the floats (or wheels) is attained is also interesting and unusual. The fuselage is, in fact, supported from the floats or wheels on outriggers rather than by the usual arrangement of undercarriage struts, and the lateral stability should be extremely good as a result of the wide track. In aerodynamic design the new Short monoplane is very "clean" and has the appearance of being efficient. We understand that wind tunnel tests on a model have shown this to be the case, and the estimated speed range is more than 2 to 1, while the climb is good. The fuselage of the Short three-engined twin-float monoplane is arranged for two pilots side by side behind the central engine. 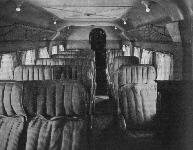 The pilots' cockpit, is provided with windscreen and sliding side windows, and a sliding roof for use in very hot climates when the cockpit might become uncomfortably warm. The view from the cockpit should be excellent. The two seats are designed to be raised and lowered during flight. The dual controls consist of foot bars and wheel control. Immediately aft of the pilots' cockpit is the forward luggage compartment, which provides space for crew's effects, light luggage of passengers, etc. On the starboard side the W/T equipment is installed. A bulkhead with sliding door forms the rear wall of this compartment and the forward wall of the saloon. The latter has seating accommodation for 17 passengers, or 16 passengers and a steward. The seats are arranged three abreast, two close together along the starboard side and the single seats, separated from them by a gangway, along the port side. The dimensions of the saloon are: length, 17 ft. (5 18 m.); height, 6 ft. (1 -83 m.); and width, 6 ft. 2 ins. (1-88 m.). Large windows are fitted in the sides of the saloon, capable of being opened. The walls of the saloon are partly lagged with sound-proofing material to reduce external noise as much as possible. Fans will be installed to assist in the ventilation of the saloon. The passengers' chairs will be of a type similar to those used in the "Calcutta" flying boats, which have been found very comfortable and at the same time of low weight. These chairs are of duralumin tubing, upholstered in leather and having seats and back-rests in the form of air cushions which, when detached from the seats, form very effective life-belts in an emergency. There are two entrance doors to the saloon: one in the port side forward, which is the passengers' entrance and reached by a gangway on the sloping strut from the port float; the other on the starboard side, aft of the main saloon, giving access to the main luggage compartment. On the port side of the luggage compartment, and separated from it by a wall, is the lavatory, completely equipped with folding wash-basin, etc. A sliding door separates the lavatory from the saloon. A very complete electrical equipment is to be carried including navigation lights, interior lighting, riding lights, and "out of control" lights. Provision will also be made for wing-tip flares and dashboard lighting. The dual-purpose generator for electrical and W/T equipment is mounted on the top of the fuselage, immediately aft of the sliding roof over the pilots' cockpit. The instruments carried will include the usual altimeter, airspeed indicator, etc., and also, if required, a Reid turn indicator, oil-pressure and temperature gauges, etc. Revolution indicators with large dials will be fitted in the wing nacelles, visible from the cockpit, and a tele-tachometer coupled to each engine will give a record of the running of the engines during flight. A P.4 compass is provided for the pilot, and an 0-3 bearing compass for use in navigation. Suitable positions are provided in the machine for the taking of all the necessary readings with the 0-3 compass, and a chart board, and stowage for charts, instruments, etc., is also provided. Arrangements will also be made for the fitting of a periscopic drift-sight on the starboard side of the cockpit. The machine will be fully equipped with the Marconi A.D.8 transmitting and receiving set, the instruments being placed in a readily accessible position in the forward compartment. The aerial passes out through the bottom of the fuselage and is wound in on a reel when not in use. An emergency aerial, is fitted for use when the machine is at rest on the water, being attached at one end to a mast projecting from the top of the fuselage and at the other to the tail. Complete marine equipment is also to be provided, as well as a special type of gantry by means of which the engines can be changed while the machine is afloat. The main overall dimensions of the Short three-engined twin-float monoplane are: wing span, 107 ft. (32-6 m.); length o.a., including servo rudder, 69 ft. 8 ins. (21-2 m.); overall height (seaplane), 19 ft. 6 ins. (5-95 m.); overall height (landplane), 15 ft. 6 ins. (4-73 m.). The total wing area, including ailerons, is 1,382 sq. ft. (128-5 sq. m.); area of ailerons, 179 sq. ft. (16-65 sq. m.); area of tail plane, 106 sq. ft. (9-85 sq. m.); area of elevators, 94 sq. ft. (8-73 sq. m.); area of rudder, 50 sq. ft. (4-65 sq. m.); area of fin, 42 sq. ft. (3-9 sq. m.); area of servo rudder, 6-5 sq. ft. (0-605 sq. m.). The calculated tare weight of the machine, inclusive of saloon equipment, is 12,701 lbs. (5,780 kgs. ), and as the C. of A. covers a gross weight of 20,685 lbs. (9,400 kgs. ), the disposable load is 7,984 lbs. (3,620 kgs.). The disposable load may be made up as follows: Petrol (350 gallons at 0-78 lbs. ), 2,730 lbs. (1,240 kgs.). Oil (27 gallons at 10 lbs. ), 270 lbs. (123 kgs.). Total fuel, 3,000 lbs. (1,363 kgs.). The rest of the load may be made up in the following manner: Crew and kit, 660 lbs. (300 kgs. ); 17 passengers and luggage (17 at 210 lbs. ), 3,570 lbs. (1,620 kgs. ); W/T equipment, 250 lbs. (113-5 kgs. ); electrical equipment, 75 lbs. (34-1 kgs. ); instruments, 100 lbs. (45-4 kgs. ); marine equipment, etc.,200 lbs. (91 kgs. ); signal pistol and cartridges, 8 lbs. (3-64 kgs. ); fire extinguishers, 21 lbs. (9-55 kgs. ), water for various services, 100 lbs. (45-4 kgs.). Total, 4,984 lbs. (2,262-6 kgs.). The estimated performance is as follows: For the machine as a seaplane: Maximum speed at sea level, 136-5 m.p.n (220 kms./h. ); minimum speed, 67 m.p.h. (108 km./h); initial rate of climb, 910 ft./min. (4-63 m. per sec. 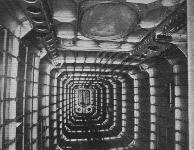 ); service ceiling, 15,000 ft. (4,575 m.); rate of climb on two engines, 300 ft./min. (1-52 m. per sec. ); range at cruising speed, 500 miles (800 kms.). As a landplane the estimated performance is: Maximum speed, 140 m.p.h. (225 kms./h); minimum speed, 66_ m.p.h. (106 kms./h. ); initial rate of climb, 1,040 ft./min. (5-28 m. per sec. ); service ceiling, 16,500 ft. (5,000 m.); range, 500 miles (800 kms.). As the Short three-engined twin-float monoplane has a gross weight of 9,400 kgs., and a normal total power of 1,455 b.h.p., the power loading is 6-46 kgs./h.p. The wing loading is 73 kgs./sq. m., and the "wing power” 11-3 h.p./sq. m. The Everling "high-speed figure" in the metric system is thus 16, which is very good for a three-engined machine. SEAPLANE versus Flying Boat is a subject which appears still to be as open to discussion as is the even older problem: Monoplane or Biplane? And at the present moment no one can say quite definitely what is the answer to either. Great Britain has, by following a programme of intensive development during recent years, established a lead in the matter of flying-boats which it will take foreign nations some time to overtake. We are referring now to flying-boats that are really seaworthy in the sense in which we use the expression in this country. We do not think anyone will seriously challenge that statement. Other nations may have produced larger flying-boats; but that they have produced more seaworthy flying-boats we doubt. Put in another way, we believe most people who have studied the subject at all carefully will admit that our relatively small flying-boats possess more real seaworthiness than some very much larger boats that have been turned out elsewhere. From that one might, perhaps, argue that if British constructors were given orders for much larger flying-boats than hitherto, they could legitimately be expected to produce something having real seaworthiness - something that would live in almost any sea. That is likely to be proved or disproved in the not too distant future. However, that is a subject which does not concern us here. In view of the acknowledged superiority of British over foreign flying-boats, it may seem somewhat surprising that a firm which has established a world-wide reputation for their flying-boat products - Short Brothers of Rochester, to wit - should have turned aside for a moment from the development of a type with which great success has been achieved to explore the possibilities of a very different type of machine. In reality, it was very natural that Short Brothers should do so. Mr. Oswald Short has, ever since he and his brothers began aircraft work in the earliest days of flying, been in the habit of looking far ahead. While busy on turning out types which have attained success, he is known by those who know him best to be always wondering whether even greater success might not be the reward for striking out along new lines. The firm of Short Brothers have done a vast amount of experimental work during the last five or six years, and the reward for that expensive work is now materialising in the form of substantial orders, manufacture under licence abroad, and so forth. But it is not in the nature of Mr. Short to sit down and take it easy on the results already achieved. He is a deep thinker and something of a visionary; but his success hitherto is ample proof that he is very far from being an idle dreamer. Some of the novel projects have not been an unqualified success, but out of the many experiments made there have been surprisingly few failures. And the experience gained, even by those experiments which were least successful, must be of inestimable value to the firm. It is now a good many years ago that Mr. Short happened to mention to us, during a conversation, that he was by no means convinced yet that the large twin-float seaplane might not, for certain work, offer a better solution than the single-hull flying-boat. At the time we do not think Mr. Short had any definite idea that he was likely, in the near future, to be in a position to test out his theories on a really large machine; but that opportunity has now present itself, and the result is the "Valetta" monoplane which forms the subject for these notes. Built to the order of the Air Ministry as an experimental aircraft with a view to testing the relative merits of the twin-float seaplane and the flying-boat, the "Valetta" differs in more than its flotation members from the usual British flying-boat. She is, in addition, a monoplane of all-metal construction, and equipped with a power plant comprising three Bristol "Jupiter" XI F geared engines. In other words, the "Valetta" represents a radical departure from what has become orthodox British practice. From the fact that the new machine is of approximately the same gross weight as the "Calcutta," it should be relatively easy to obtain an illuminating comparison between the two, and to throw light on the question: Seaplane or Flying Boat? A fairly detailed description appeared, exclusively, in FLIGHT of August 22 last year, and now that the machine has been finished and flown, there are a certain number of changes to be noted, mainly in weights, as compared with figures given by us nearly a year ago. The general lay-out of the "Valetta" is well shown in the general arrangement drawings on p. 827, from which it will be seen that the machine is a high-wing monoplane in which the wing bracing is arranged in a somewhat unusual manner. Outriggers springing from the top and bottom longerons of the fuselage meet outboard in a point, and to this point are attached the wing-bracing struts and the float struts of the undercarriage. The whole forms a series of triangulated bays, statically stable and capable of transmitting loads in two directions. The two wing engines, it will be seen, are supported on the wing spars only, i.e., there is no strutting to the outriggers. The floats are very widely spaced, and lateral stability on the water should be very good, although when running diagonally in a considerable seaway the wide spacing of the floats might conceivably tend to swing the machine off its course. The fuselage, although actually of large dimensions and giving full head-room, looks small in proportion to the large wing, and interference drag should not be excessive. That the minimum drag coefficient of the machine must be fairly small is shown by the fact that the top speed attained, i.e., 135 m.p.h., corresponds, for the wing and power loading of the machine, to an Everling "high-speed figure" of 16, which must be regarded as high for a three-engined machine and especially in view of the fact that the machine is a seaplane. In structural design the "Valetta" follows fairly closely the "Calcutta." The fact that the former is a monoplane and has a fuselage has necessarily meant changes in dimensions, but no very great changes in the constructional methods employed. The monoplane wing is of the normal two-spar type, the spars being of the usual Short construction, with flanges and webs of Duralumin, corrugated for stiffness, and the flanges laminated to approach as closely as possible to uniform strength throughout. The ribs are girders of Duralumin tube. The fuselage construction of the "Valetta" resembles that of the hull in the "Calcutta." That is to say, the transverse members or frames arc continuous, while the fore-and-aft stringers are interrupted at the frames and secured to them by gusset plates. The planking, of sheet Duralumin, is riveted to frames and stringers, as in the boat hulls. The power plant of the "Valetta" consists of three of the new Jupiter series XI F engines, one of which type has, as recorded elsewhere in this issue, recently passed a very strenuous type test. One engine is mounted in the nose of the fuselage and the other two in streamline nacelles under the wing. In order to reduce the amount of vibration transmitted from the engines to the aircraft structure, a novel form of shock-absorbing or vibration-damper arrangement has been evolved. This consists in interposing between the engine plates and the supporting structure a series of rubber pads, as shown in one of our sketches. The engines are, in fact, "floating on rubber," and the reduction in vibration which can be noticed in the cabin is very considerable. The petrol tanks are housed in <...> direct gravity feed to all three engines. Engine starting is by means of a Bristol gas<...> on top of the fuselage, and when the machine <...> and the main engines not running, this engine <...> driving the general-purpose generator for lighting <...>less service. Hand-turning gear is also provided. The Duralumin floats, of typical Short form and construction, are of very large dimensions, as will be realised when it is pointed out that each float is nearly 40 ft. long, while the displacement is 22,500 lb. The floats are mounted on struts from the outer points of the outriggers, and are braced laterally by diagonal struts to the lower longerons. Although primarily an experimental aircraft, the "Valetta" is completely equipped for passenger service. The cabin, which measures 17 ft. in length by 6 ft. 2 in. in width and 6 ft. in height, has seating accommodation for 16 passengers, but this number is subject to alteration according to the service for which the machine is required. The seats are similar to those used in the "Calcutta" and consist of a tubular framework, with air cushions for seats and backs, the air cushions being removable and so designed that they can be used as life belts in emergency. The ventilation system has been carefully thought out, and the windows are set low in the side walls of the cabin so that passengers can look out and down on the sea without craning their necks. Aft of the cabin is a large lavatory fitted up with wash basin, &c, and aft of that again is the luggage hold, which has a large hatch in the roof through which the luggage can be hoisted by means of a portable derrick carried on board. The luggage hold hatch also serves as an emergency exit for the passengers. 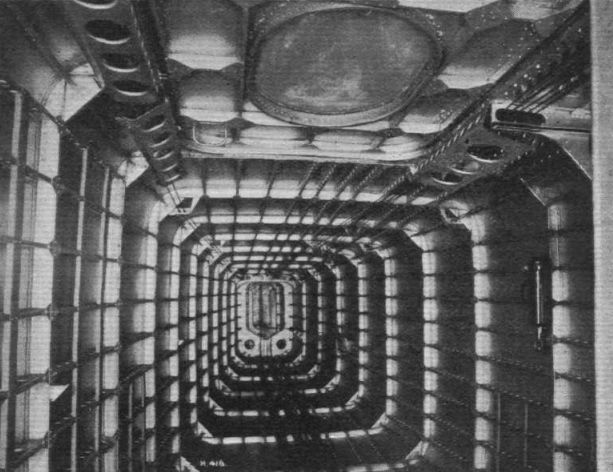 Entrance to the cabin is by a door in the port side, and when boarding the machine from a launch, passengers walk up a narrow stairway formed on the side of one of the float struts. Ahead of the cabin, and communicating with it by means of a sliding door, is the pilots' cockpit. This is situated near the nose of the fuselage, immediately behind the central engine, and from it a very good view in all directions is obtained. Provision is made for two pilots, placed side by side on seats which can be raised and lowered. The windscreen surrounds the whole front portion of the pilots' cockpit, and a sliding panel is provided in the roof, while the side windows in the cockpit are made to slide. In the after part of the cockpit there is space for the wireless equipment, the "Valetta" being provided with transmitting and receiving apparatus. The equipment consists of a Marconi A.D.8 set, which has a range, under normal atmospheric conditions, of about 300-400 miles on C.W. telegraphy, and 200-250 miles on telephony. The Short "Valetta" is probably the first British machine of its kind to have been designed primarily as a seaplane, but with a land undercarriage designed concurrently. 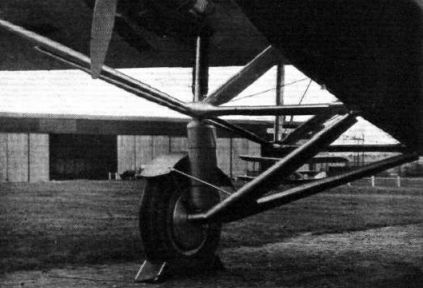 The substitution of the land undercarriage for the floats is a very simple affair, and for use on long air routes, such as over great portions of the British Empire, an operating company would benefit considerably by this interchangeability, as the one type of machine can be used on all stages of the route, the number of spares required being correspondingly reduced. The main dimensions of the "Valetta" are shown on the general arrangement drawings. The tare weight is 14,535 lb. (6,605 kg.) as a seaplane, inclusive of cabin equipment, and as a landplane the tare weight is 13,985 lb. (6,365 kg.). The disposable load is the same in both versions, i.e., 7,865 lb. (3,575 kg. ), giving a gross weight for the seaplane of 22,400 lb. (10,180 kg. ), and 21,850 lb. (9,940 kg.) for the landplane. The disposable load is made up as follows: Crew and kit, 660 lb. ; passengers (16) and luggage, 3,360 lb. ; wireless equipment, 340 lb. : electrical equipment, 75 lb. ; instruments, marine, equipment fire extinguishers and miscellaneous 430 lb. Total useful load, 4,865 lb. Fuel and oil account for another 3 000 lb., i.e., petrol (350 gallons); 2,730 lb., and oil (27 gallons), 270 lb. The estimated performance of the "Valetta" as a seaplane is as follows: Maximum speed at sea level, 135 m.p.h. (217 km./h.). Cruising speed at 1,800 r.p.m., 105-110 m.p.h. (169-177 km h.) Minimum speed, 65 m.p.h (104-5 km./h.). Sea level rate of climb, 850 ft./min. Time to 10,000 ft., 18-5 min. Service ceiling, 14,000 ft. (4,270 m.). Absolute ceiling, 16,000 ft. (4,880 m.). Range at cruising speed, 520 miles (835 km.). For the landplane the figures are very similar, but the top speed is slightly better (138 m.p.h. ), and the rate of climb is 880 ft./min., while the service ceiling is 14.800 ft. and the climb to 10,000 ft. occupies 17-5 min. DESIGNED as long ago as 1929, and first flown in July of 1930, the Short "Valetta" was, it may be remembered, built to the order of the Air Ministry for the purpose of testing out the relative advantages, for certain classes of work, of the twin-float seaplane and the single-hull flying-boat. 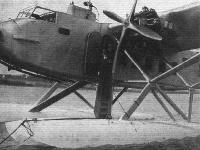 The "Valetta" also had the further design feature that a wheel land undercarriage could be substituted for the floats, so that the machine could be used on a long air route where certain sections were most suitable for seaplane operations, others calling, by geographical reasons, for an aeroplane. 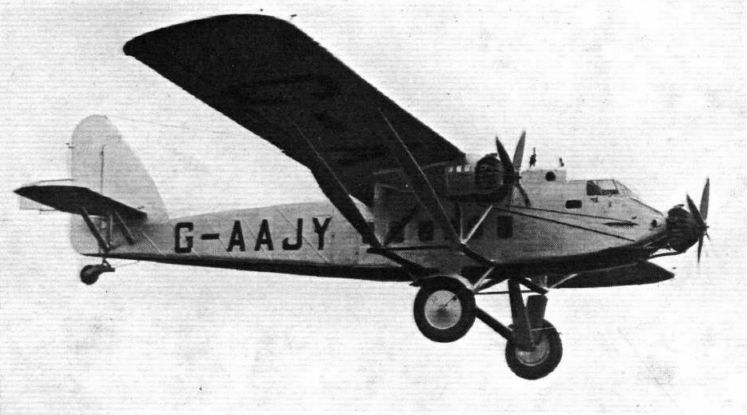 In view of the fact that the air route from Cairo to the Cape covers all manner of country, it had been generally assumed that when this air route was opened by Imperial Airways the "Valetta" would be put on certain sections of the route, first as a seaplane and later as an aeroplane. This, however, was not done - for what reason we do not know - and it was left to Sir Alan Cobham to try out the machine in its seaplane form on an African tour which he made last year. Sir Alan returned from that tour full of enthusiasm for the "Valetta," but, in spite of this fact, it is not, we understand, the intention of Imperial Airways to make any use of the machine. 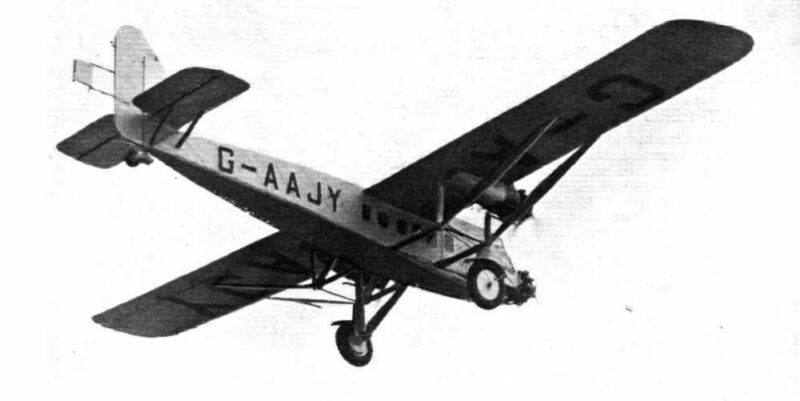 As the "Valetta" was built to the order of the Air Ministry, and is still the property of the Ministry, it may be assumed that any further work will probably be of an experimental nature, and the machine has now been fitted with its wheel undercarriage and was tested in flight on Friday last by Mr. Lankester Parker, Short's test pilot. The "Valetta" looks curiously large on an aerodrome, much larger than she did as a seaplane on the Medway. And, of course, she is not a small machine - with a wing span of 107 ft., a wing area of 1,382 sq. ft., and a gross weight of 21,850 lb. On Friday last the machine was, of course, flying with but a small load, but the ease with which she left the ground seemed to indicate that even when carrying full commercial load, the take-off should be good. The landing run was short, in spite of the fact that Mr. Parker made "seaplane landings," i.e., with the tail well up. Probably the Palmer wheel brakes had something to do with this. 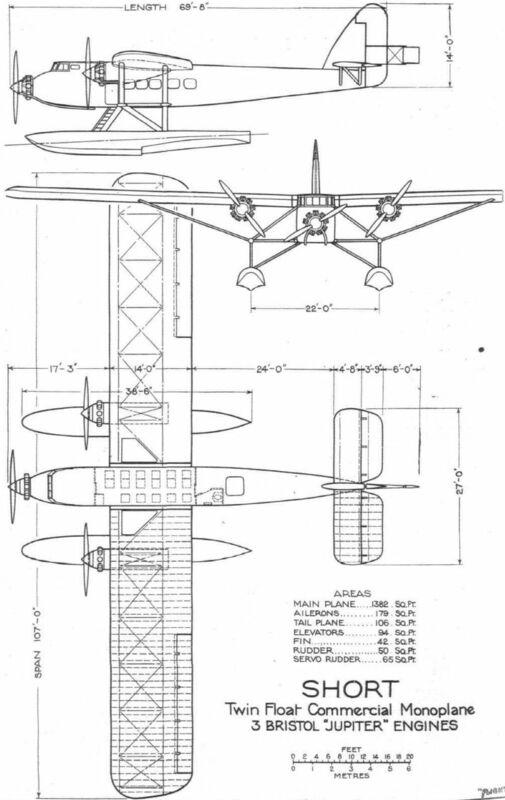 Some criticism was levelled at the height of the cabin door above the ground, but it should be remembered that the machine was designed primarily as a seaplane, and that the height of the engines, etc., above water level is then a very desirable feature. The machine deserves to be put to some useful work, and it is to be hoped that the powers that be will see that this interesting experiment is not wasted. A detailed description was published in our issue of July 25, 1930. LONG before aeroplanes came into being Short Brothers were aeronautical engineers in that in 1897 they had established their own balloon factory. When the work of Wright Brothers and other experimenters began to become known Short Brothers were quick to realise the tremendous possibilities of heavier-than-air craft, and at once set to work to design and construct. Since those early days (1909 or so) they have never looked back, and to-day Short Brothers are among the most esteemed of British aircraft firms. 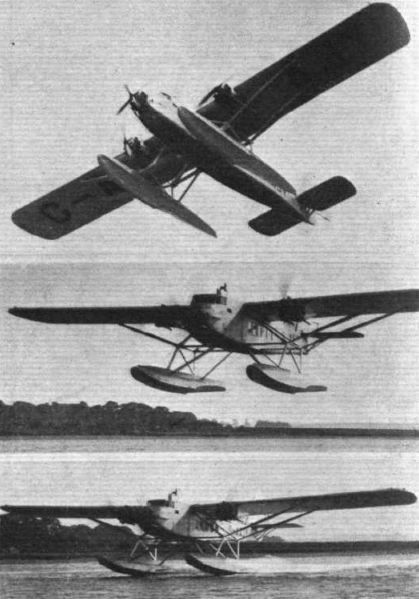 Twin-float seaplanes were among the first Short machines to be constructed, and ever since then the firm has been closely connected with the development of marine aircraft. Of recent years these have been mostly of the flying-boat type, although other types have also been produced. Originally designed as a twin-float seaplane, the "Valetta" (three Bristol Jupiter XI.F) monoplane has also been fitted with wheels and flown as a landplane. The fuselage is of a construction similar to that used in the Short boat hulls, and the wing has Duralumin spars and ribs. The cabin has accommodation for 16 passengers. THE SHORT "VALETTA": The cabin is reached via steps housed in the fairing of the front port strut of the float undercarriage. 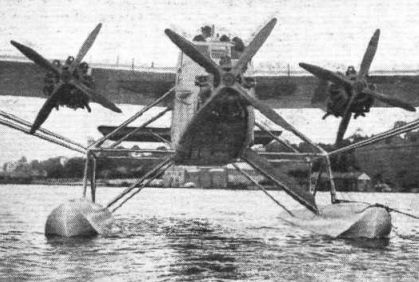 THE SHORT "VALETTA": The large mono-seaplane, fitted with three 490 h.p. Bristol "Jupiter" engines, in which Sir Alan Cobham is making a survey flight to Central Africa. A BRITISH EFFORT: The Short "Valetta" three-engined (Bristol "Jupiter") seaplane, built to order of the Air Ministry for commercial air transport. LATERAL STABILITY: The floats of the "Valetta" are set wide apart and should make the machine very steady on fairly calm water. THE SHORT "VALETTA": Approximately of the same weight and carrying capacity as the "Calcutta," this machine is an interesting experiment to determine the relative merits of twin-float monoplane and ordinary flying-boat. THREE STAGES IN THE TAKE-OFF OF THE "VALETTA": Note the clean running shown in the lower photograph. FLOATS INSTEAD OF HULL: The Short "Valetta" mono-seaplane, Bristol "Jupiter" engines, can also be fitted with land undercarriage. 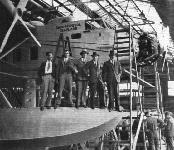 SIR ALAN COBHAM'S AFRICAN FLIGHT: Sir Alan, with other members of the crew, standing on a float of the Short "Valetta." THE LONG AND SHORT OF IT: Extreme ranges of floats constructed by Short Brothers - the large float for the three-engined monoplane (40ft. long, 22,600 lbs. displacement) and the wing-tip floats for the light amphibian (180 lbs. displacement each). LANDPLANE AND SEAPLANE: The Short "Valetta" (Bristol "Jupiter" engines) has now been fitted with a wheel undercarriage, and has been flown as a landplane. 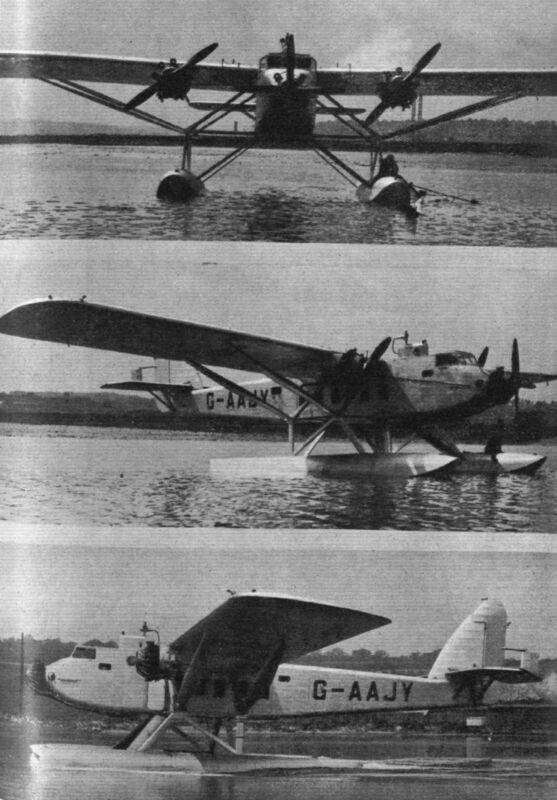 A view of the machine as a seaplane is included for comparison. 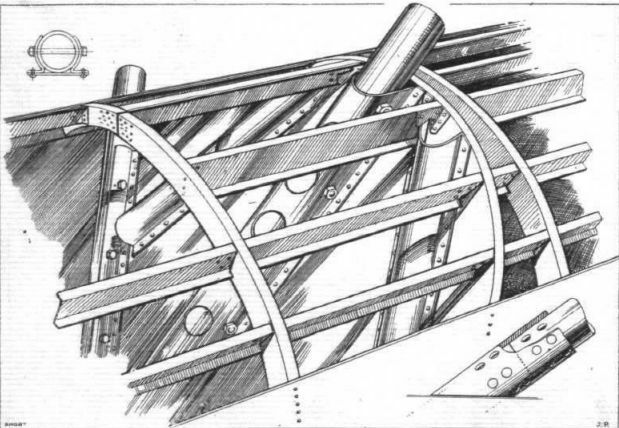 UNUSUAL BRACING: This front view shows the arrangement of the rigid strut bracing, which distributes landing loads in an unusually complete way. 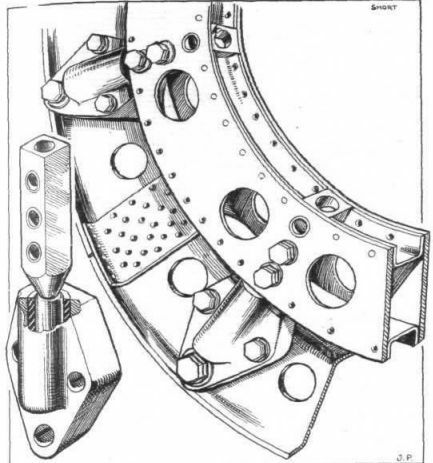 THE "VALETTA" LAND UNDERCARRIAGE: It picks up on three of the four points used in the float undercarriage, the outer rear support being idle. 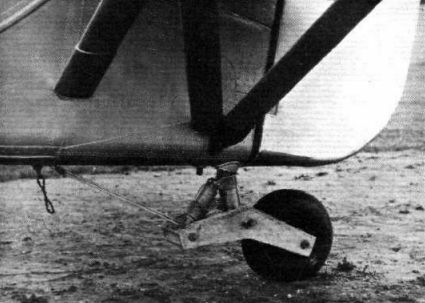 THE TAIL WHEEL: This is of the castoring type, and is centred by the rubber cords. THE SHORT "VALETTA": View inside the Cabin, looking aft. Note that the windows are set low, so that passengers can look down without craning. IN THE LUGGAGE HOLD: This view, looking towards the stern, shows clearly the absence of obstructions inside the hull. The hull frames are not cut into, while the fore-and-aft stringers are interrupted at the frames and secured to them by gusset plates. THE SHORT THREE-ENGINED TWIN-FLOAT MONOPLANE: Photographs of a scale model. THE SHORT "VALETTA": Details of the fuselage construction are shown on the left. Specially strong frames are used where the main wing spars join the body, as shown on the right. FLEXIBLY MOUNTED ENGINES: Rubber is interposed between the engine bearers and their support on the aircraft structure in order to reduce the amount of vibration transmitted to the cabin, &c.
THE SHORT "VALETTA": Outrigger strut bracing is used for wing and floats. The outrigger struts are of circular section, while the wing bracing struts are of built-up box section with a streamline fairing, added. Details of the joint between outriggers, wing struts and float struts are shown analytically. 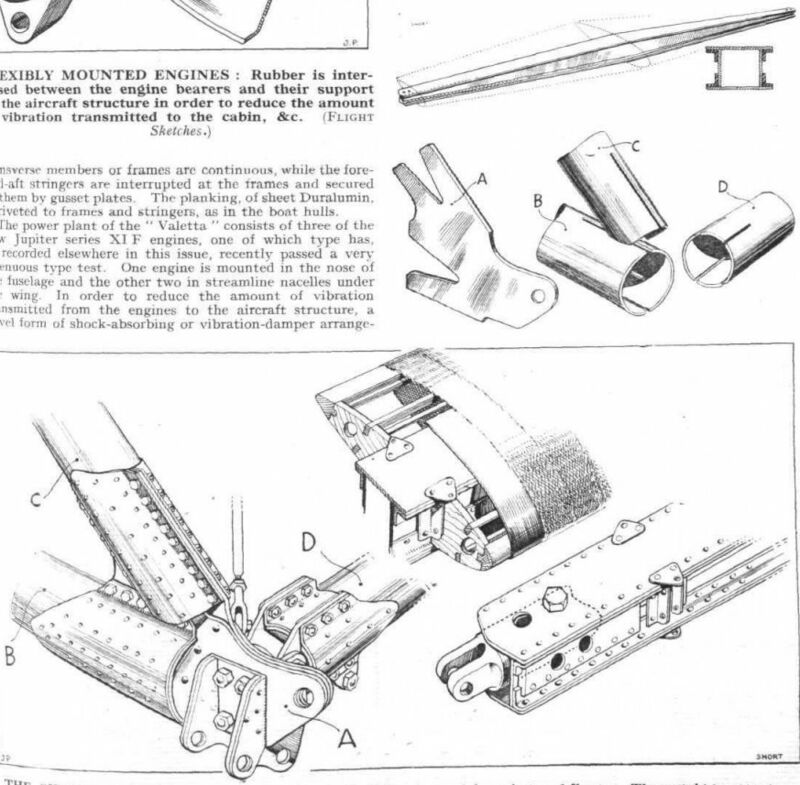 THE SHORT "VALETTA": Details of float construction and of float strut attachments. AS A LANDPLANE: Although designed primarily as a twin-float seaplane, the new Short monoplane can be converted into a landplane by fitting a wheel undercarriage.